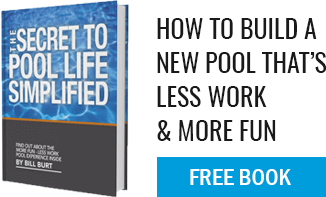 Does a gunite pool need to be acid washed regularly? NO! ABSOLUTELY NOT! There is a misconception (the internet is filled with un-truths) that gunite pools MUST be drained and “acid washed” regularly. This is a good way to “sell” service work or discourage people from buying a gunite pool (the less-than-honorable liner and fiberglass pool builders use this to sell “against” us). But it is FALSE. One need not ever drain a gunite pool unless there is an issue or if one desires to have the interior cleaned. We have pools built in the 70’s that have never been drained and never acid washed! If, after several/many years, one would like to have the pool interior surface cleaned and make it look its best, a good way to do that is with a light acid wash performed by licensed and qualified (and OSHA approved) service technicians. But gunite pools do not “need” to be drained regularly. That is up to you.